Use sideloading to quickly install an Office Add-in, on Office Online or Office 365, without having to first put it in an add-in catalog. 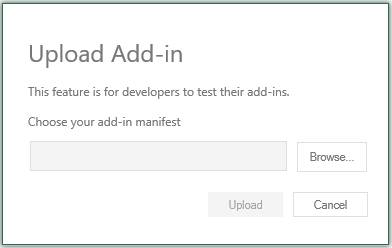 Developers can install an Office Add-in for testing without having to first put it in an add-in catalog by using sideloading. Sideloading can be done on either Office 365 or Office Online. The procedure is slightly different for the two platforms. See the sections below. When you sideload an add-in, the add-in manifest is stored in the browser's local storage, so if you clear the browser's cache, or switch to a different browser, you have to sideload the add-in again. Sideloading as described in this article is supported on Word, Excel, and PowerPoint. To sideload an Outlook add-in, see Sideload Outlook add-ins for testing. Navigate to your Office 365 account, and login. Open the App Launcher on the left end of the toolbar and select Excel, Word, or PowerPoint; and then create a new document. 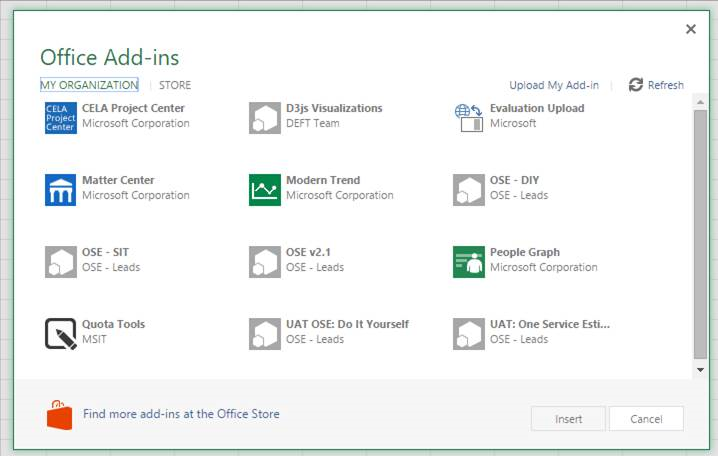 Open the Insert tab on the ribbon and, in the Add-ins section, choose Office Add-ins. On the Office Add-ins dialog, select the MY ORGANIZATION tab, and then Upload My Add-in. Browse to the add-in manifest file, and then select Upload. Verify that your add-in is installed. For example, if it is an add-in command, it should appear on either the ribbon or the context menu. If it is a task pane add-in the pane should appear. In Get started with the online apps now, choose Excel, Word, or PowerPoint; and then open a new document. 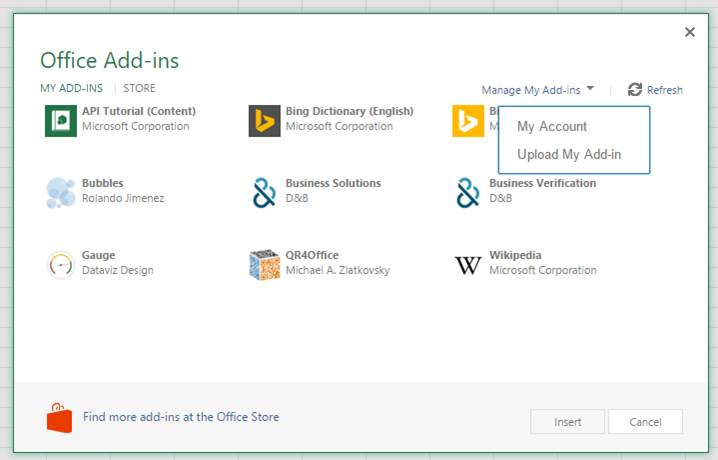 On the Office Add-ins dialog, select the MY ADD-INS tab, choose Manage My Add-ins, and then Upload My Add-in.